In Part I of this post, we covered a lot of territory about thyroid physiology, and went into considerable depth in some areas. We left off discussing the different affects of the D1, D2 and D3 deiodinases on the pituitary as compared to other tissues of the body. The conclusion we’d arrived at is that due to completely different deiodinase activities intrinsic and extrinsic to the thyroid, using serum TSH levels to assess thyroid function is unreliable. We’d also established that using serum values for other thyroid hormones, e.g., T4, free T3, is unreliable because these measures cannot show the affects of D1 deiodinase activity on cellular receptors and/or what the affects of free T3 will have within the cells of the body. Using TSH to assess thyroid function is unreliable for various reasons. One reason is that as one’s health deteriorates, their intra-pituitary D2 activity increases, while D1 efficiency in peripheral tissues drops away. And while this is happening, serum TSH levels (as well as serum TRH levels from the hypothalamus) will commonly fall within the normal range. As an aside, the normal range for TSH has been widely criticized as being far to broad to serve any real purpose, and we’re seeing clearly that using TSH exclusive of other factors is to miss the point entirely, and to do so in the face of compelling evidence to the contrary. Medicine is a religion, and religions tend to adhere to dogmatic beliefs, which remain curiously averse to reason. Moving on from TSH, let’s have a look at the affect of declining health on cellular vs serum T3 levels. As health declines, there are predicable symptoms that arise together, and I’ve mentioned them so many times that even I get tired of listing them: depression, anxiety, atherosclerosis, dyslipidemia (LDL, VLDL & HDL imbalances), hyperinsulinemia, high and/or low blood sugar, NAFLD, metabolic syndrome, central adiposity (weight gain around the midsection), chronic illnesses, autoimmune conditions, chronic fatigue syndrome, obesity, adrenal issues, hormone imbalances, sleep dysregulation, etc. I also harp on the fact that all of this is happening together. Nothing happens in isolation. And as all of these issues begin to develop—and you may be saying to yourself, “Yeah, but I don’t have all of those problems. I’ve only got a few.” Which may be true, but not everyone is going to develop every symptom I listed. Suffice it to say that if you’re dealing with some of them, there are issues to be dealt with. And as all this is happening, thyroid production of T3 steadily declines. It’s estimated that serum T3 levels will drop by 30%—and this will be reflected in lab tests—but there’s a concomitant drop of tissue T3 levels of 70-80%! Which is huge, and it explains why so many people are experiencing so many health issues: a 70-80% drop in cellular T3 levels relegates a person to functioning like a zombie in every possible way. Learning requires repetition, especially when you’re overcoming years of having related to situations incorrectly. Just as I and many others make the point that TSH is unreliable, we’re now recognizing that darn near all serum lab values are unreliable measures of thyroid function. If that’s the case, then how do you know if your thyroid physiology is functioning optimally? You have to pay attention to how you feel. 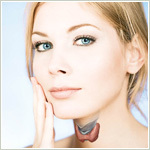 You have to supply your system with enough iodine and tyrosine, as they’re the building blocks of thyroid hormones. You have to heal all the aspects of your body and mind that don’t currently support healthy thyroid function. This includes gut microbiota, liver function, leptin and insulin signaling, sleep patterns to name a few. The artistry of being a doctor is quickly becoming lost. It’s being replaced by technology, by specialization and compartmentalization, and we’re losing touch with our humanity in the process. Life and health are about something far greater than any of us spend much time wondering about, and it’s no wonder we’re where we’re at. What’s going on with thyroid physiology mimics what’s going on with humanity. Healing either of them requires the same solution, inclusion, wholeness, patience, big-picture orientation, and opening our minds to new ways of relating to ourselves and the world. Stress is inseparable from every chronic health issue there is, and hypothyroidism is no exception. Chronic stress decreases D1 deiodinase activity, increases D3 deiodinase activity, which converts T4 into reverse T3. Reverse T3 competitively inhibits T3 cell receptors, blocking free T3 from binding with them. A certain amount of RT3 is normal, and there’s no set range for RT3. As always, labs are helpful, but the point is to go with how you feel, not exclusively with what labs show. With stress, intra-pituitary D2 activity is upregulated, which results in increased T3 levels within the pituitary, causing it to produce less TSH, regardless of what the hypothalamus is encouraging it to do. Stress further complicates matters by increasing (and eventually decreasing) cortisol levels, which decreases tissue T3 levels and increases RT3 levels. This in turn results in cellular hypothyroidism, weight gain, metabolic syndrome, fatigue, depression, NAFLD…you’re getting the point. Many depressed and bipolar patients have undiagnosed thyroid dysfunction as the underlying cause or major contributor to their depression that is not detected by standard thyroid tests. The dysfunction present with these conditions includes down regulation of D1 [which reduces T4 to T3 conversion] and reduced uptake of T4 into the cell, resulting in increased serum T4 levels with low intracellular T3 levels and upregulated D3, resulting in elevated reverse T3, which blocks thyroid effect and is an indicator of reduced transport of T4 into the cell. Additionally, studies show that depressed patients have reduced T4 transport across the blood brain barrier due to a defective transport protein, transthyretin, resulting in significantly reduced thyroid levels in the brains of depressed patients despite “normal” serum levels and standard thyroid tests as well as a reduced TSH response to TRH. This is a pretty big deal, and it matches what I’ve seen clinically: depression is tied into thyroid function. Insulin resistance, diabetes and metabolic syndrome are essentially indistinguishable, and are all associated with the significant reduction of T4 to T3 conversion, and therefore diminished intracellular T3 levels. All of these conditions are synonymous with increased insulin levels, which increases intra-pituitary D2 activity and T3 levels, further suppressing peripheral T3 levels. You’re seeing the pattern, and it’s exactly the same. Whatever causes psychological or physiological stress will impede D1 activity, upregulate D2 activity in the pituitary, will go undetected in serum TSH tests, will cause intracellular hypothyroidism and increase RT3 levels. Pain, being a powerful physiological and psychological stressor, is no exception. But what happens if you take pain medications? Predictably, narcotics suppress D1 activity and upregulate D2 activity, compounding an already existing problem and contributing to cellular hypothyroidism. You’re getting the idea: darn near everything contributes to hypothyroidism, and the current means of assessing hypothyroidism (blood tests) and treating it (hormone replacement therapy) isn’t effective. What is effective? Treating the whole person. Eliminating the underlying causative factors. I promise you, this will never change…until the underlying causes are addressed, the effects will keep right on happening.